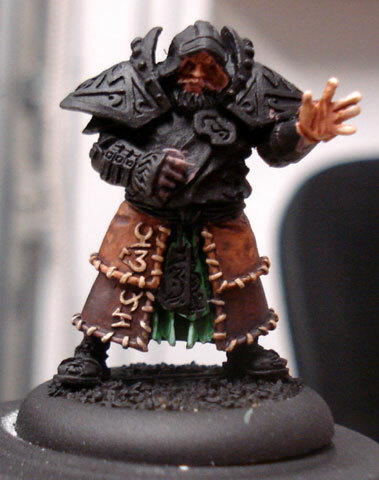 After losing handily with Baldur last night, I decided to get him painted. I’m not going too crazy with painting him–for one thing the model is pretty straightforward, especially after finishing The Old Witch of Khador. It’s a decent model, don’t get me wrong, just not from the advanced class. I like the studio paint job but I wanted some more contrast on the model. The stone sporran makes running painful. Maybe he should consider a ultilikilt. The effect is luminescent in person, in fact it almost looks opalescent, which is why I am wishing it was darker. The leather was pretty simple, I used two shades of brown–highlighted lightly with the base colors mixed with white–and a pale sand color for the stitching. Then I washed the leather heavily with Devlan Mud. I like the effect: it’s more table-ready than show-ready, but it works for me. I also have been working on the face, but it’s a tough face to paint and I think I’m about done, except for trying to get eyes in under the hood. Similarly, the fingers were really not working the way I want, so I am going to move on. 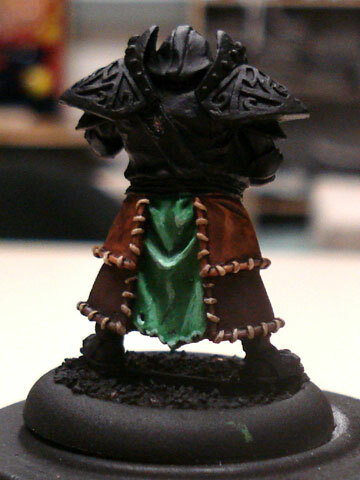 I’ll be using copper for the metal on my Circle army, so I’ll do the shoulders in green and copper. I’ll be adding the sword after the rest is painted: I decided not to pin it, too much that can go wrong working on such a thin piece, I feel. I also assembled a bunch of pieces from my army, including a few of my Druids of Orboros, and basecoated the flesh of one of my Tharn Bloodtrackers. I primered her in black, which was inattention on my part, but I’m rolling with it. Thanks,! I finished him today except for the base, hope to post photos later!